A knowledge-driven self-service support site enables developers to answer their own questions anytime, anywhere. 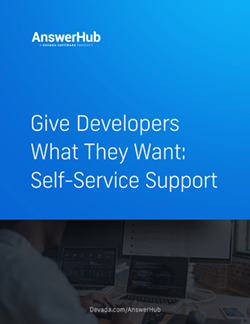 When executed properly, self-service support lowers costs, improves productivity, and leads to a more personalized and profitable developer experience. Why knowledge-driven support is important to developers and your company. Steps to take to build a self-service support community. How to measure and report on your success.